A child abuse victim who is suing a victim support charity over its handling of his claim for criminal injuries compensation has been granted a proof before answer in his £100,000 damages action. A sheriff ruled that the charity owed the victim a “duty to exercise reasonable skill and care” in acting on his behalf. Sheriff Peter Braid heard that between 1970 and 1984 the pursuer “D” and his two brothers were subjected to physical and sexual abuse by their mother, who was sentenced to five years’ imprisonment after being convicted following a trial in April 2011. 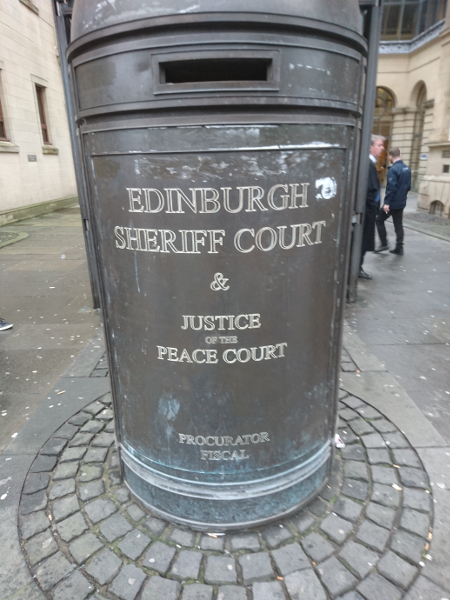 Edinburgh Sheriff Court was told that after giving evidence in the trial the pursuer was approached by a representative from Victim Support Scotland (VSS) who gave him a leaflet describing the services offered by the charity, which included assistance with claims for compensation to the Criminal Injuries Compensation Authority (CICA). The pursuer made an appointment to discuss the possibility of making a claim to CICA and attended at the VSS premises at Nicolson Square, Edinburgh on 11 May 2011, where he met one of their employees and told her that he wanted to pursue a claim for compensation. The VSS employee filled out an application form based on the pursuer’s answers to the questions she asked and the pursuer then signed the form, which named the charity as his representative. During the course of their meeting the pursuer gave brief details of the sexual and physical abuse that he had suffered at the hands of his mother and indicated that he was still receiving treatment for his mental health problems. He also told her that he had previously been in employment but added that “since this happened I have lost my job”, but the VSS employee did not inform the pursuer of his potential eligibility for a loss of earnings claim. Over the next two years VSS elicited further information from the pursuer from time to time, but at no point did VSS advise him that he could apply for loss of earnings were he to be off work for more than 28 weeks as a result of the abuse he had suffered. On 17 May 2013 CICA wrote to VSS offering compensation to the pursuer of £17,552.50, which consisted of tariff awards for injuries under the 2008 scheme for “permanent mental illness and physical abuse suffered as a child”, reduced by 15% to reflect an unspent conviction. There was no award for loss of earnings, but the letter was accompanied by a document which stated that if earnings were lost or reduced for at least 28 weeks, compensation may be available from the 29th week. It was also accompanied by standard guidance on how to seek a review of the decision, the time limit for doing so and a form to do so. The following month the pursuer attended the VSS office in Edinburgh to discuss the proposed award, where he met a different employee who also failed to mention loss of earnings or that it was possible to review the award, but he did tell him that the offer was for the “correct amount” and that there was “no room for improvement”. The pursuer returned to the VSS office two days later to sign the acceptance form, but he later discovered that his brother had received had received a substantially higher award than himself, including a claim for loss of earnings. The pursuer contacted VSS to ask why he had not been informed about making the loss of earnings claim and another VSS employee agreed to contact CICA on the pursuer’s behalf, but the agency refused to review his claim. The pursuer raised an action for damages of £100,000 in respect of the defender’s allegedly “negligent” handling of a criminal injuries compensation claim on his behalf. On behalf of the pursuer, Simon Di Rollo QC submitted that the pursuer did suffer wage loss, having been off work for more than 28 weeks as a result of the abuse, and that he was entitled to receive compensation therefor, but that VSS “failed in its duty” to explore that possibility with him. If they had, it was argued, he would have received a higher award, namely one which would have included wage loss. However, on behalf of VSS Laurence Murphy QC denied that the charity owed the pursuer any such duty, and that if they did, there was no breach. The court ruled the defender owed the pursuer “a duty to exercise reasonable skill and care” in acting as his representative in his application to CICA and that it was a “basic component” of the duty incumbent on the defender that the pursuer be advised of his potential claim for wage loss. The sheriff found that there were a number of factors which pointed towards the defender having assumed responsibility to the pursuer, including the “relationship between the parties, which was akin to a contractual one, whereby the defender agreed to provide a service to the pursuer which comprised assessing his eligibility under the CICA scheme” and completing and submitting the application on his behalf. In a written judgment, Sheriff Braid said: “I therefore find that in the exercise of their general duty of skill and care, the defender had specific duties to tell the pursuer that he may be entitled to a sum for loss of earnings; to assess whether he was eligible to claim a sum for past or future loss of earnings, by exploring the issue of wage loss further with him; and to explore with him whether in June 2013 he should apply to CICA for a review of the award. To that extent, I have found the pursuer’s averments of duty to be proved. The sheriff allowed a proof before answer, with a procedural hearing assigned for 17 January 2018.